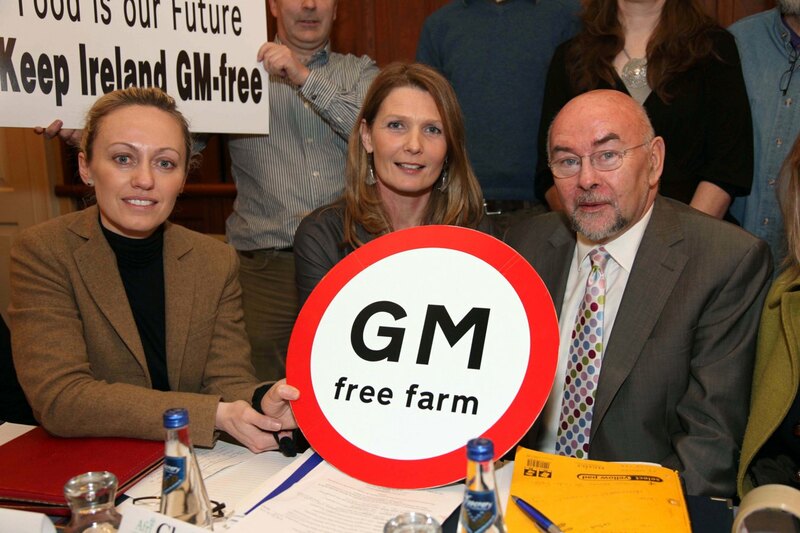 The presence of the Labour Spokesperson on Science, Ruairi Quinn at an anti-GM press conference raises questions about the party's credibility on the GM issue. At a recent talk I presented on the GM crops issue and in a recent article here and for the Guardian science blog, I suggested that the GM issue had now become an election issue. On Monday, celebrity chef Clodagh McKenna along with people from "food, farming, conservation and human rights sectors" gathered in Dublin to speak about what their press release called the "inherent dangers of new moves to allow a relaxing of laws in relation to genetically modified food and feed". See the bottom of this post for a video from Monday's press conference. Calling the GM "lobby" the "Anglo-Irish Bank" of the food sector, the grouping called for (amongst other things) another moratorium on GMO. Representatives from the Irish Organic Farmers and Growers Association (IOFGA), Western Organic Network, Irish Seed Savers, and Afri amongst others met to denounce what they called a "dubious scientific review" of the GM issue. All very predictable. It is to the direct economic benefit of the organic sector to ensure that GM does not get a fair hearing. It is to the direct economic benefit of the organic sector to scare consumers into rejecting GM food products. It is analogous to the guy who produces white bread telling consumers that brown bread will give them leprosy - it has absolutely no scientific basis, but as a marketing ploy, it does wonders for white bread sales! What was most surprising about the press conference was the very visible presence of Labour spokesperson on Education and Science Ruairi Quinn TD. Labour are against the cultivation of GM crops on the island of IrelandIt is surprising given the stated position of the Labour Party on the issue. Although Labour are against the cultivation of GM crops on the island of Ireland, they are in favour of the importation of animal feed potentially containing trace amounts of GM material. The party's 2006 21-part plan for "A Quality Future for Rural Ireland" commits the party to "work towards the aspiration of a GMO production free island of Ireland within the context of the relevant EU and UK legislation and in the relevant national and international fora. "Until that aim is achieved", the policy document continues, "the Labour Party will push for the strongest possible evidence-based rules governing the release of GMOs into the environment". Two things strike me as interesting about this statement. First is the careful wording of the the first paragraph and the aspiration of a "GMO production free island", clearly not ruling out the importation of GM animal feed - as is the party's stated policy. Secondly, the plan calls for "evidence-based rules" governing the release of GMOs. These evidence-based rules do not seem to be important when deciding the core position- that of being for or against GM crops. While the Labour Party are to be commended on clearly spelling out their position on GM (the party line of anti-GM cultivation but pro GM importation seems quite straightforward), the presence of the party's science spokesperson at Monday's launch suggests a different viewpoint. Speaking at a meeting of the Oireachtas Joint Committee on Agriculture, Fisheries and Food Debate in 2008, Sean Sherlock, Labour Spokesperson on Agriculture and Food pointed out: "The EU scientific committee has applied a certain rationale which is based on common sense and practical solutions. If it is advocating a certain position [on the GM feed issue], I do not understand why the Government is not adhering to that advice or why it would abstain on votes when the time comes". "if the EU scientific committee advises and recommends that we import certain feedstuffs, I do not see why the Government cannot approve it" - Sean SherlockThere is no dichotomy or contradiction between maintaining the biodiversity of this island and the importation of EU-approved feedstuffs. The two are not mutually exclusive. It is reasonable to express reservations about scientific trials on the growth of GM feedstuffs pending further debate and dialogue. However, if the EU scientific committee advises and recommends that we import certain feedstuffs, I do not see why the Government cannot approve it. We have all bought into that process by virtue of our membership of the EU", said Sherlock. The labour spokesperson continued: "The precautionary principle is rolled out when it is politically expedient to do so. The Green wedge or wing of the Government has a politically philosophical position on these issues and there is a certain constituency to which it must play. This is to the detriment of Irish agriculture and ultimately the Irish consumer who will end up, if we continue on this route, paying less but without a guarantee that imported livestock or meat products from third countries are GM-free." very visible endorsement of a GM-free Ireland concept which specifically, according to the groups own press release, is also strongly opposed to the importation of animal feed potentially containing trace amounts of GM material. 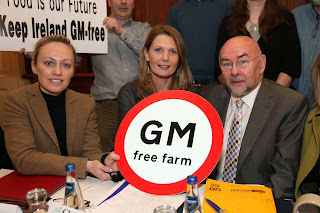 it is sending senior figures to campaign for a GM free IrelandThat the Labour Party is against the cultivation of GM crops in Ireland is clearly laid out in their 2006 policy document. I would argue that there is no scientific basis for this position, but that is beside the point. What is problematic for the party is that on the one hand it is sending senior figures to campaign for a GM free Ireland - and against imported animal feed potentially containing trace amounts of GM material; while on the other hand saying that it is not opposed to the importation of such feed. As I've said, the Labour Party have a clear policy on this issue and while I disagree with it, they are to be commended for outlining that position, unlike a number of other parties. 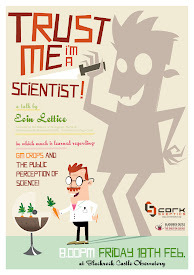 However, the voting public deserve to know whether or not a potential Minister for Science in the next government has rejected the overwhelming volume of scientific advice on this matter and has arguably been used as part of a marketing strategy for the anti-GM lobby. The following video is from Monday's press conference. Ruairi Quinn sets out Labour party policy from 2:30 min onwards. the problem with your argument is that you are looking only at this through the eyes of a scientist; looking at what can and cannot be proven. you take the view that if there is no proof that GM food does any damage we should all accept it as a positive. firstly there has not been eneogh time to verify this but more importantly for irish agriculture and farming it is the perception of our target market which matters. ireland and our farmers and food producers can not afford to continue competing on a price only basis, we must develop a brand which appeals to those willing to pay more for their food; an important element of that brand needs to be a gaurantee that irish food is GM free. this may not make sense to you from a scientific perspective but it makes alot of sense from a business perspective. A valid point. As I pointed out in my article, from a business perspective it makes sense for organic producers to propagate mistrust of GM. There may well be an economic argument for staying GM free. My problem with this argument however is that the unique selling point for GM-free foodstuffs is just that - that it is GM Free. This naturally implies that there is something wrong, dangerous or risky about GM from a human/animal/environmental health point of view. This notion is not supported by the science, despite the organic lobby's attempts to suggest otherwise. Science does not support many marketing claims. (Guiness gives you strength, Because You're Worth it, etc). This isn't a problem unless they are downright misleading, harmful or dangerous. What is a problem is when producers of one product attempt to influence public policy in opposition to their competition. The organic food sector should advance their strengths - local, traceable, low mileage, seasonal, fresh and not scaremonger. firstly, the 'organic' lobby is only one objector. I would object on the basis that all Irish food producers, conventional, artisan, organic would benefit from a GM free Ireland. it is generally accepted that Ireland needs to move away from competing in the commodity food market; we do not have the scale or low cost base; neither does our society want very large industrial farms that would be needed. in order for us to compete as at higher level we need to develop the brand we have. this is a real competitive advantage. the only benefit from using gm crops in Ireland would be a very small cost saving but the disadvantage would be to close off potentially lucrative markets, whether you believe those consumers to be mislead or not is irrelevant. The scientific community should continue to investigate the pros and cons of using genetically modified crops; from a lay man’s perspective I cannot see how this could be conclusive in any but a very long time-frame; while it enhances our competitive advantage to put Ireland and our produce forward as GM free we should push this policy. 1. how long would be enough time to satisfy him on the safety of GM??? 2. developing a brand to high end consumers is fine and can be done in coexistence with GM (as done in the US, AUS, etc, etc)....moreover I sense there might be less and less people "willing to pay more for their food"
4. where is the data than "all food producers" will benefit from GM free branding (assuming its even successful)? "it is generally accepted that Ireland needs to move away from competing in the commodity food market"
REALLY?? Generally accepted by who? Surely not by Irish producers who send enourmous quantities of exports to Europe, Russia, North Africa and the Middle East securing thousands of Irish jobs? Is it just generally accepted by those who share your views on GM? As someone who has worked with GM bacteria under containment conditions, I am acutely aware of the dangers of GM to human health, agricultural and environmental safety etc., so please don't be swayed by those who want to protect the Multinational Corporations interests, whatever their investment in Ireland. Be aware genes spread, in nature, to weeds and to micro-organisms in the digestive system. Staying GMfree is more then a marketing strategy, it is a health and safety strategy for our island. 1. as I said it is a lay-man's point of view, i really don't know how long, it would seem to me when we change the genetics; the fundamental building blocks of our environment; it may take a very long time for those changes to be properly assessed. 2. we can have and do have individual brands which would continue in co-existence with GM, although they would be damaged as one of the main strengths of almost every Irish food brand is that it comes from what is perceived as a 'green' and 'clean' environment. the real gain for Ireland will be the development of a common brand under which to sell those products which are in general now being sold as commodities, beef, lamb, dairy etc. because of our small size and our access to the EU market we are well placed to do this. 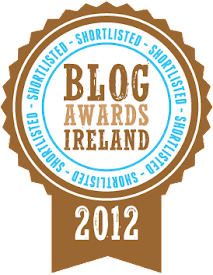 Fundamental to this brand will have to be the perception of consumers that Ireland is a 'green' clean' food producer. GM is not the only issue here and we have lots of work to do. On the contrary there are more and more people in Europe and around the world willing to pay more for their food, this growth parallels a greater demand for food at lower and lower prices; which market would you like to target? 3. We can, through our government make a number of commitments around gm, e.g. 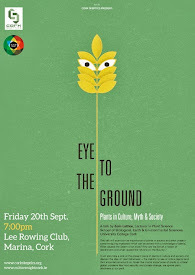 we will not allow gm feed, we will not use gm seed etc, and this 'charter' would back up our ‘green’ brand. Given its lack of scale and cost disadvantages, Ireland is not going to win the commodity game. It must have a high margin export strategy’’. The report lays out how Ireland can use many of its natural advantages to create a sustainable and profitable food industry. Central to this strategy is the Ireland food brand and the brand promise must be– ‘’we are natural and we can prove it’’. There is a sizable section of this target market who do not trust GM foods. Some major European multiple retailers have already released sizable GM free food brands. This is not because they think GM is good or bad but because they know there is a profitable market. Thanks for writing on this, Eoin! I'm glad someone's talking sense in it all. Let's not pretend that the opposition has anything to do with caring about Ireland's economic future (for a start, most of the people involved are "local food" advocates, who've never taken a slight interest in Ireland's export industries before). It has everything to do with ideological opposition to a thus-far safe, appropriate, environmentally-beneficial technology. If you'd read the excellent book Tomorrow's Table you'd see that this "green" organic image you're after, is not incompatible with GE. The overarching problem with this "GM free Ireland" nonsense, is that it contributes to an horrific distrust and disregard for science, which ends up being far more harmful in Developing countries as our well-fed opinions translate into moratoria in countries which could benefit substantially from this technology. Read Starved For Science for a detailed analysis on this.